The book will enable mandolin pickers to take their places next to fiddlers and other melody players in the rich musical traditions of Ireland and Scotland. 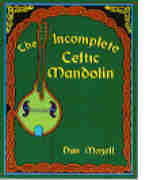 Dan Mozell is a guitarist and mandolinist who performs traditional music from Ireland, Scotland, England and America. For the past 15 years he has been performing traditional and contemporary music with his wife, Celtic harper Bobbie Wayne. In addition to performances at clubs and festivals, he interprets 18th century music at historic sites.